As many of our clients know, we particularly enjoy rare and unusual military timepieces. We pride ourselves on offering historic examples from around the globe; watches that were created by famed watch houses for the purpose of keeping the war running on time. Few people realize the effort put into military timepieces. Often, they were manufactured out of a sense of duty for a particular cause: sometimes they were produced reluctantly, an effort that took away from day-to-day business and the bottom line. They were, however, the product of a great effort, often representing the most advanced engineering of the day. Officers tended to wear timepieces from better watch houses, while enlisted men wore standard military issue produced wholesale by strong, but lesser regarded manufacturers. Both genres are highly collectible today. We are delighted to offer this remarkably crisp, World War I era Patria wristwatch. As many of you may know, Patria movements were produced by Omega and marketed under the Patria name. During World War I, Omega made a brilliant marketing decision by entering a still unproven wristlet market created by soldiers in Europe. 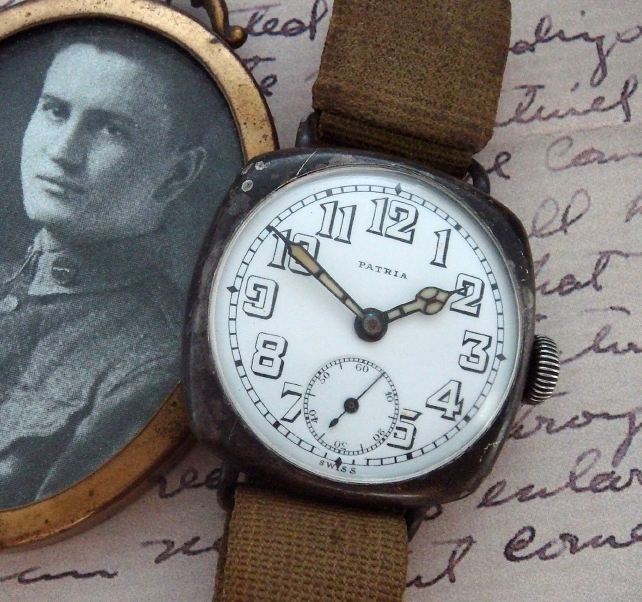 Their Patria name became synonymous with the trench watch, and by the end the war, every man recognized the advantage of having a watch on his wrist — instantly accessible — versus a pocket watch that one would have to fumble to retrieve. The move proved to be quite profitable for Omega: today they remain one of the finest watch houses in the world. This stunning example, in a solid sterling silver case, would have been the pride of some wealthy World War I officer who could afford to purchase a fine timepiece for himself. Wristwatches were in their infancy and not issued until World War II: if you were soldier and wanted to a watch, you bought one for yourself or did without. Measuring 40mm by 33mm, this work of tactile wrist art is so impressive, it appears to be factory fresh. There are absolutely no dings or dents in the case, which is as tight as the day was made. Adding to the rarity of the piece is what appears to be its original WWI era canvas strap with "U.S." marked buckle. It features a magnificent and completely original porcelain dial — marked Patria — with glorious oversized numerals, sub-seconds register, and stained-glass hands. Open its un-engraved back and you'll find a completely and professionally serviced, 15 ruby jewel Patria movement that is as remarkable today as it was what was manufactured. Because of the watch's unusually crisp original condition, we have chosen to leave it in its unpolished state, with existing patina. If the client wishes, we’re happy to hand-polish the case at no additional charge. Also, the strap was originally sized at 6 ¼ inches nearly 100 years ago when it appears to have been put away: We are leaving it exactly the way it came to us, unadjusted and as it emerged from its estate. If the client wishes, we will remove the original strap and custom-fit the watch to the wrist with a two-piece cordovan strap with matching sterling buckle. In such case we would, of course, include the original canvas strap to be kept with the watch. If you are looking at a definitive example of early wrist art or work of military horological history, you may have found your treasure.